Home > Another brick in the wall: is hexane neuropathy a 'nodo-paranodopathy'? 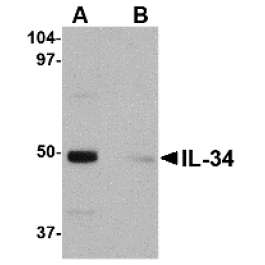 > Anti- > Interleukin-34 IL34 antibody Isotype IgG Host rabbit details. Rabbit anti Human, Mouse, Rat Interleukin-34 / IL34. Western Blot: 0.25 – 0.5 μg/ml. Background Interleukin-34 (IL-34) was identified through a functional screening of a library of secreted proteins after transfection of an embryonic kidney cell line with recombinant cDNAs. Flow cytometry and monocyte viability assays demonstrated increased survival and/or proliferation of monocytes induced by IL-34 and specific binding of IL-34 to CD14+ monocytes. IL-34 is a second ligand to the colony stimulating factor (CSF)-1 receptor in addition to CSF1. Like CSF1, IL-34 stimulates phosphorylation of ERK1 and ERK2 in human monocytes and induces differentiation of bone marrow cells into macrophages. Despite its predicted molecular weight, IL-34 will often run at higher molecular weight in SDS-PAGE. References 1. Lin H, Lee E, Hestir K, et al. Discovery of a cytokine and its receptor by functional screening of the extracellular proteome. Science 2008; 320:807-11. Storage Store the antibody undiluted at 2-8°C. This antibody reacts to IL-34.